Data from satellite offices should be easily accessible. Satellite offices are also part of an organization, and must be managed as such. Datalab OTOS is the ideal solution for an affordable automatic database synchronization. DataLab OTOS is a program for automatically synchronizing databases for Datalab software. e-mail is used to transfer databases. No user intervention required for OTOS if you have a permanent or dial-up Internet connection. As soon as the program is started up, OTOS synchronizes databases. A user window shows the progress of synchronization, and the program keeps a log that enables users to view past synchronization events. Because OTOS uses the Internet to send data, it is very affordable. Regardless of the database location, the transfer price is equal to the price of a sent e-mail. Therefore, there is no need for pricey and expensive permanent server connections, which is particularly useful for companies with branch offices in different countries. Making use of compression and differential transfer reduces the transfer time and minimizes the associated costs. 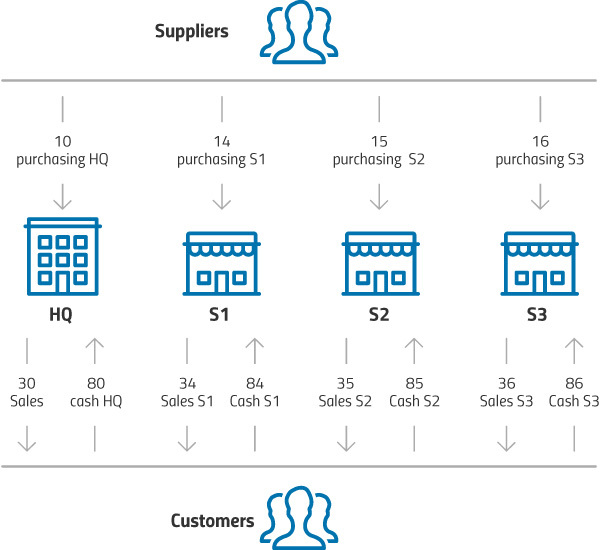 Imagine the following scenario: a company consists of a central location and three stores (business units). The central location would like to receive information from the stores about customers and items sold. It would like to receive orders and issued invoices from the store and integrate these documents into the central database. The company sets up a special e-mail address (transfer@company.com, for example), which will be used for all data transfers between the central location and the stores. In this case, the central location is the master and the stores are slaves. Each store has its own profile which contains the following information. Datalab OTOS synchronizes databases by adding and changing data. To ensure correct synchronization of databases, only one user at a time may edit a specific piece of information. This requires well-organized document types and user authorizations for them. Each location that needs to be synchronized should have its own document types, i.e. separate from other locations. The chart below shows an example of such an organization of document types. The main office and all the stores have their separate warehouses and document types for receiving (shipping) and issuing goods (sales), and cash receipt and disbursement. Because all business units receive orders, you should open corresponding document types for orders. Such a setting is required because of the independent operation of each site. Otherwise numerous errors would occur during document numbering. However, if we make the appropriate setting according to the shown scheme, each business unit has document types in which numbering is performed separately (the unit is the administrator of its own document type). With the appropriate authorization setting such a system is reliable and functions independently. 1. The receiving warehouse has no influence on what was transferred. Since a transfer slip is received at the business unit on synchronization of databases, it debits the warehouse irrespective of whether the goods have been actually received in transferred quantity and that appropriate products were issued. 2. The receiving warehouse will receive stock only after the transfer. If the business unit has a restriction on issuing a negative warehouse balance (the business unit cannot issue prior to receiving), then it will not be able to issue the goods until the synchronization between warehouses was performed. Controlled transfer solves the shortcomings of the uncontrolled transfer, but it is more labor intensive. Instead of a transfer slip you use an internal issue slip and receiving slip. The issuing warehouse creates and issues an internal issue slip, and the receiving warehouse issues an internal receiving slip. Thus, the inventory is immediately relieved at the issuing warehouse, and posted at the receiving warehouse when goods are received. Transfer control is simple because you only create an intersection between the issuing and receiving slip and immediately determine whether the items got lost on the way. Material movement transfers using OTOS influence the inventory. Documents changing the warehouse status are only imported in the database using OTOS. It does not make a status recalculation. After importing material movement at the central location, it is therefore necessary to refresh the inventory when the operation finishes. At the business units to which you export reports on inventory at the central location (and maybe at other business units as well) always run stock refresh only for the business unit’s warehouse. If stock would be refreshed at all warehouses of the business unit, the inventory at all other warehouses would after refresh show 0 status due to the lack of other material movements (that are usually not transferred to the business unit). Using computerized technology and Datalab software you can invest considerably less work at a lower cost. The company monitors its operations in PANTHEON. Enters prefetched received invoices (items, without or with accounts) and issues invoices. Because the system includes both the input and output of goods, the company can manage material accountancy by itself, and therefore the stock is no mystery anymore. The company can submit the data prefetched using OTOS to the accounting firm that posts them to corresponding general ledger/subsidiary accounts. In addition, the accounting firm posts the bank-related items (payment transactions), calculates and posts payroll and creates VAT records directly from transferred data. With the next transfer (synchronization), the company receives financial information from the accounting firm which are available to the management to conduct analysis and take decisions (subsidiary accounts, price differentials, profit/loss). This method of work and minimum implementation at the clients (companies) means major labor savings at the accounting firm since from our present experience the implementation of PANTHEON in accounting firms saves up from 50% to 85% on work. The accounting firm is much more competitive and more profitable. But satisfaction is also on the side of companies that finally obtain current data and also lower costs in the event that the accounting firm shares profit with the customer. Solutions such as this which are based on win-win situations are the reason to implement modern information technology and a validation of the Datalab’s motto “Turning Data into Profit”. If you want to know anything about Datalab’s additional solutions, we are always available ! Call us or send us a question by e-mail.